“Any reptile expert would say the same: that the snakes’ reaction to their predicament was completely inevitable." Animal charity Wild Welfare has raised concerns about physical and psychological harm to snakes in a recent episode of I’m a Celebrity, Get Me Out of Here. The charity said it believes two snakes were harmed during a challenge where a female contestant placed her hand into a small compartment containing the snakes, prompting one of them to lunge at her several times and appear to bite. Field director and herpetologist Dave Morgan said: “This situation would have caused the snakes quite extreme physical and psychological harm. It was a highly stressful situation that did not allow the snakes the recourse of escape, so forcing them to react in the only way they knew how. 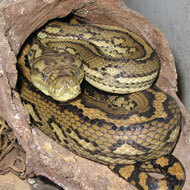 Carpet pythons have small, solid teeth that face backwards in their mouths. Wild Welfare said it is likely they would have hooked into the contestant’s skin. When she then snatched her hand out of the compartment, the snake would have been pulled from the floor, dangled, then dropped from a height. It is thought this would cause several teeth to be snapped off or pulled out. Being wrenched could also cause long-term spinal issues for the snake. Meanwhile, the charity said the contestant would likely have received only a superficial scratch or tiny skin punctures. Groves said I’m a Celebrity has a “great opportunity” to educate people about unique species in a way that does not compromise their welfare. The charity has written to producers at ITV Studios to highlight its concerns over the episode and its ongoing use of wild animals. ITV has been contacted for comment.